Rue La La recently launched a handbag guide, covering the bases of popular everyday styles to signature details of famed brands, and even a brief history of styles over the centuries. It's definitely worth checking out. In honor of this, they asked to take a peek inside my bag, so today we are going to rummage through my garbage. I realized the other day while in the process of writing this post that this Mulberry has been my everyday handbag since 2010. That is a long time, and a lot of wears, but I think it says something. A simple, classic satchel will stand the test of time. What you tote around inside of it every day also says a lot. Have you ever wondered what's inside of this old thing? Probably not. But I'm going to tell you anyway. 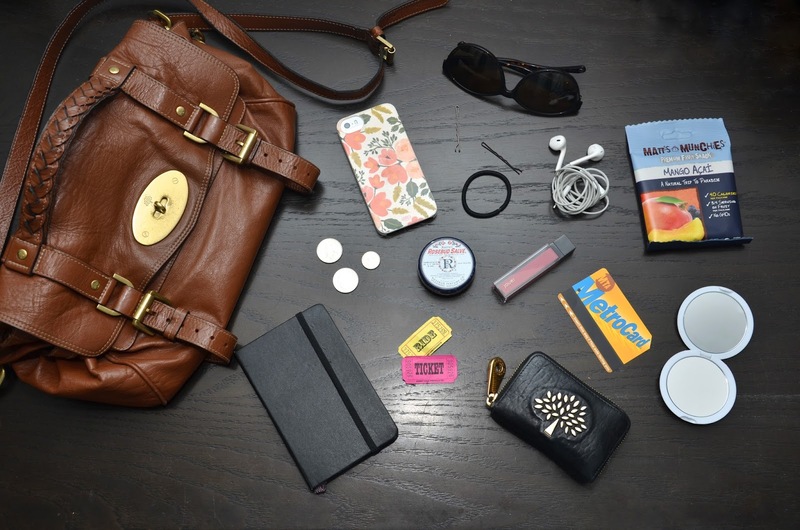 Once your spill all of the contents of your purse out onto a desk, it forces you to consider what you carry around everyday, what is important to you. There are obvious things that you need like a metro card and wallet. There are things that just seem to accumulate like loose hair ties, bobby pins, and old receipts. There are your every day basics, your favorite lip gloss, sunglasses, a small mirror, and a snack. And then there are the things that are always in there, no matter how many times you clean your bag out, like UCB tickets (the yellow one is from Bucky, one of my favorite teams), these pence (a memento from our trip to London years ago) and a small notebook used to capture adventures and improv classes. After all these years, I still really love this bag. The cross body strap makes it handsfree, the neutral hue goes with everything, and it's big enough to fit a book and a sandwich, because as the briefcase is the adult lunch box to JD, my purse is mine. I love taking a peek into other people's bags! :) I do love that bag! Eeek, this just made me feel like a hoarder inside my purse haha. A simple bag is always worth the investment! I love that Mulberry bag so much!!! It was seriously on my lust radar for so long especially in that color! Love that phone cover! I wish my purse was organized but it's definitely not. I have long been admiring your beautiful Mulberry collection! This bag is beautiful - the color, the style - it makes me want one!! and I know what you mean about what's in my bag...it's basically full of junk haha But I am loving your cell phone case! Good work- four years is serious for a handbag!! I had a purse that my BFF bought me for my birthday, and I loved it. Carried it faithfully for five years, until this past year I finally retired it, and sprung for a frye bag. It's heaven, and I hope to carry it for years to come. Lovely post!! Omg my bags never last more than a year! And I totally live by rosebud salve :) Love your blog! Just followed you on instagram, pinterest, GFC and bloglovin. Looking forward to future posts! I love seeing what is in other people's bags! I have so much stuff I don't even need. Love that Mulberry bag!